The Cane Creek DBair: early reports are coming in. Starting with the usual caveat, this is a quick report based on first impressions. YMMV, and experience with other frames will not produce the same results. I'm not a suspension expert or technical supergeek so look elsewhere for deeper reviews of a more technical, background nature. Comparison is set directly against a high mileage 2011 DBcoil on the same frame. Visually the DBair is a sweet looking piece of work. Thrown on the Makulu it delivers slick clean lines that match the frame design. I had a bit of a minor tussle aligning the valve with the frame, choosing 10.30AM positioning, looking from the front of the bike. Cane Creek's video is helpful, but I was surprised how hard it was to turn a new stiff shock body to the correct position. The eyelets have a slightly wider dimension than the DBcoil so I had to mess with spacers and there's some sort of thin rubber based liner to the rear eyelet that made the installation job a bit harder. Getting a shock pump in there to access the valve is no problem at all. If you're a weight weenie, or just want a more playful, responsive build, you'll be pleased to know that the shock dropped 320g over the coil, based on a 250lb steel spring. I had a couple of 2000' descent DH runs, one slower and greasy, with some wide open sections to test, including some rocky rough sequential small and moderate square edged hits to test, and another much faster and flowy trail with lots of moderate suspension spikes and sequential rolling arm pump sorts of lines. There wasn't much in the way of drops or bigger hits to test, as I was limited to riding natural DH trails. I set my shock up at 85 psi based on sag at a perfect 40%. It's refreshing to be able to measure sag and shock travel down to the millimeter using the shock's o-ring, giving you the confidence that your sag is totally dialed. An initial ride around the driveway indicated it is very similar to the coil, in that I'm using 75-80% of shock travel just doing the parking lot test. On trail, I tried pressure at 90 psi just to see if I was missing anything and I definitely preferred the feel of 85 psi. I felt that it tracked the terrain really well, gripping everything. This season I'm running a sprightly, very responsive, 35.5lb Makulu, and sometimes it's a bit of a challenge to keep it grounded and in trail-hugging mode, which we know is one significant benefit of the Makulu with it's 40% sag and low leverage delivering amazing traction. I didn't want to lose that benefit, and although it's too early to say definitively, I think the air shock may allow me to keep that lively, agile responsive low weight as well as the ground-hugging mode. That's a lethal, amazing combination and achieves the best of both worlds. One very distinct thing I noticed is that the back end is extremely quiet, not just in terms of audible noise, since the bike made barely a sound. But just in general terms, the shock feels very crisp, fuss free and precise in nature. Coupled with quiet hubs and components, the bike had a real stealth feel, creating a mode that allows me to focus 100% on my riding with no distractions whatsoever. First impression reveals that the air feels very similar to the coil, and I could tell that just 100 yards after I dropped in. I know you'd expect that, since the valving is the same, so I guess that “no surprises” is a good thing. 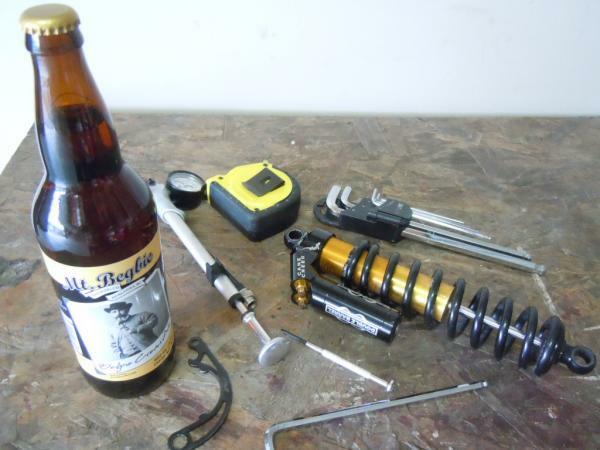 I didn't feel as much feedback coming from the shock shaft, compared to the coil. By comparison, somehow it seemed like it was insulated from something. Not being overly technical, I'm not sure what could cause this but for me it's definitely a “better” feel. The shock feels very crisp, accurate, "deep" and plush, and really comes alive at higher speeds where it really felt good. I definitely found the sweet spot and seemed to be running just up to the last ½” or so of travel. I knew I wouldn't get much more travel today based on limited airtime and lower speed than normal due to the wet weather and greasy slimy trails, but I don't think I will have a problem getting into the last ¼” to ½” based on higher speeds and bigger hits. If I do I'll play with the HSC a little, and I'd even be prepared to play with dropping the PSI a little just to tweak things. But overall, it's not a concern to me right now. I've heard of other frames not getting full travel from the DBair, so I hoped to dispel this fear for the Morewood community. I used Cane Creek's stock settings as recommended by Malcolm (LSC 12, HSC 1.15, LSR 13.5, HSR 1.5), based on the DBcoil settings. Out of the box, with not much chance to fine tune it, it felt really good. It felt like the DBair soaked up more of the square edged hits and responded better in a more crisp and precise way, than my coil, deflecting less and keeping speed better. One of my criticisms of the Makulu and DBcoil was a tendency to hang up on mid speed square edged hits, and for me it seems to have improved that aspect. I deliberately chose some slower lines through haggard rock chatter, and felt like I wasn't losing speed due to deflection. Rolling, techy, arm pump sort of undulating terrain at flat out speed felt amazing, and I was very impressed with how well it handled that stuff. One criticism I had already heard about the DBair was a tendency to offer a low level of mid range support and a bit of a dead wallow. To be honest, based on how the Makulu rides, I think we are probably already used to something of that nature. Knowing that the Makulu really comes alive when pushed hard, and doesn't really do a whole lot when you are dithering around on a trail with not much happening, I was wondering what that early feedback was all about. I can't really say much about this, as personally I think it's the nature of the beast and I didn't get a less or more favorable impression regarding mid range from the DBair. 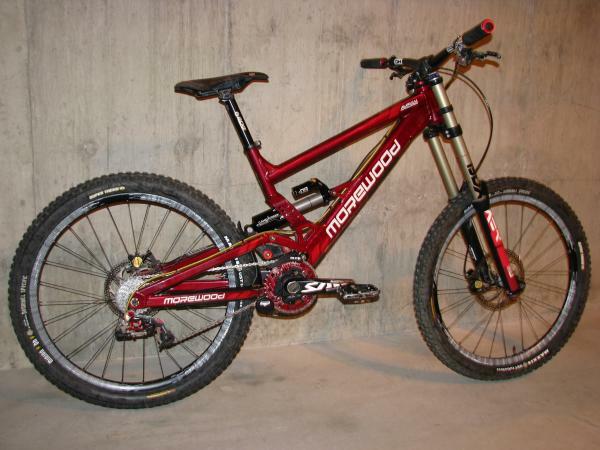 The Makulu is meant to go flat out fast in rough or smooth terrain, even when you think you're opening it up, it has so much more to offer and positively tempts you to get into speeds that might not be good for your health. In my humble view, that mid range is just the point before you get into the real lively action zone and personally, I don't expect much to be happening with the shock in that mode. What else do you expect from something that runs 40% sag and is meant to go flat out fast? On the Makulu, the tolerance inside the frame, where the air can and frame has about >1mm gap and is definitely prone to mud build up and canister scratching. It's unavoidable, given how tight it is in there. Frame tolerances may vary, and for you my 1mm may be 2mm, as on paper it's supposed to be about 2mm either side. The terrain I rode had hard, granular rock chip based sort of dirt that sticks in hard layers, and the canister is already rubbed from something getting stuck in there just on one side. There was no rubbing underneath, at the back of the circular cut out piece, which is where I expected it to rub. If your trails consist of organic matter you'll be fine, but if you ride on granular hard gritty dirt and prefer a pristine condition for your components, either stick to coil or don't ride in mud and muck. 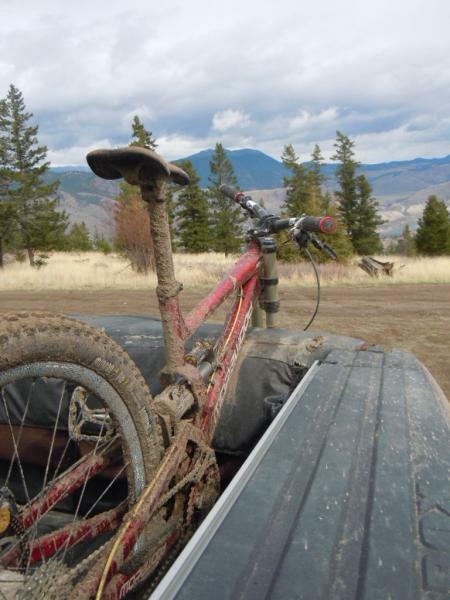 The mudguard succeeds at keeping a lot of muck out of the general shock area, but it can't keep everything out of that tight space, and all it takes is a few deposits of harsh material to rub. 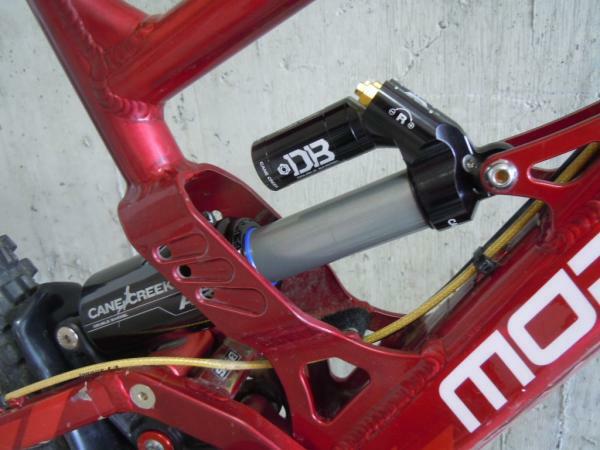 Definitely make sure your shock is centered in the frame due to the lack of space. I didn't do a heat test to see how hot the shock body got. 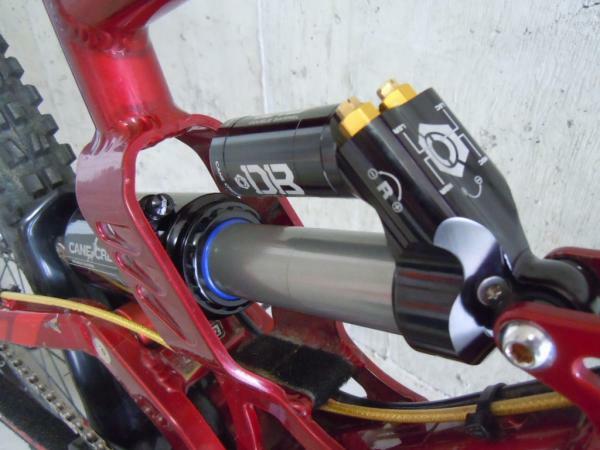 It'll be interesting to see if the air shock suffers a performance fade, something that is a critical issue for DH racers running 4 minute courses or guys like me who are banging out 15 bike park laps a day. I think Makulu riders got lucky with the DBair. We have a nice linear suspension curve and low leverage ratio. PSI can be set comparatively low, meaning the shock isn't ramping up as aggressively and isn't working quite as hard as it is on other frames. We can easily handle a bit more ramp up, in fact that's probably a good thing as it allows us to get a bit more lively and playful on the bike without sacrificing much of the ground hugging nature of the Makulu. Based on my initial experience, I'm very impressed. If it's good early indicator, it didn't slow me down at all, felt totally familiar and a natural transition from coil to air, and if the weather had been better I think I'd have been pushing it much harder than normal. I'm not sure if air is "better" but it definitely doesn't lose anything over the coil version based on initial feel, and I got benefits from better mid speed action on square hits and a significant weight drop on the build. Time to play with the shock settings, and tweak like a geek.